This was my fifth Wordpool event and possibly the hottest! The event takes place at Stanley Park, Blackpool, with hundreds of families attending. The park is filled with lots of things to do and see and it’s completely free! 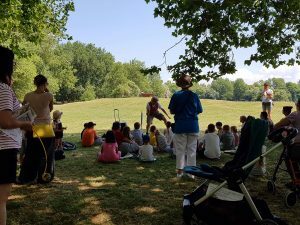 This year saw performing trees, a circus tent, an elephant accompanied by a storyteller and some fabulous flying birds, to name but a few of the amazing attractions. I teamed up with the fab folk from Blackpool libraries to perform some of the Tales. 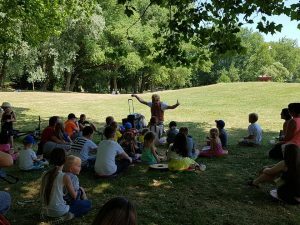 I put on four performances across the afternoon, in the cooling shade, sharing stories that featured pirates, cow pats, trumps and a crime-fighting wig! The children were a joy to work with, as were their adults. Despite the scorching conditions, everyone had an ace time. It was a joy to perform some of the Tales in the glorious Blackpool sunshine. I’d like to thank the organisers for inviting me along and Jane Berry for sharing her pics.